Loss of limb, head trauma, disfigurement, severe neck and back injuries and broken bones can have a devastating effect and drastically change your life and the lives of those close to you. When these traumatic events are caused by accidents at work or by someone else’s negligence, you may be eligible for a personal injury claim which would entitle you to be compensated for your injuries and loss of work. Serious injuries can leave you feeling helpless and alone. But the truth of the matter is that you have rights. You have the law on your side to help pay damages you for your losses. But you have to take the first step and contact legal representation. 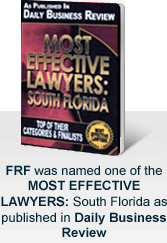 The Miami serious injury lawyers at Friedman, Rodman & Frank, understand all the intricacies of personal injury law. We’re on your side and we will listen to you, the client, and do whatever it takes to ensure justice prevails. We understand the human side of the law. We know that serious injuries are not only traumatic physically, but they are traumatic mentally as well. Serious injuries usually result in the loss of wages, medical expenses, physical therapy, exorbitant expenses and major changes in lifestyle. If you are seriously injured or harmed because of someone else’s act or failure to act, personally injury law, also known as tort law, is designed to protect you. In a successful action, the person who suffers the losses is compensated by the one who caused the injury. Health care and social assistance – back injuries are common from physically handling or lifting patients and from slips, trips and falls. Also, workers in this industry are exposed to viruses which can lead to serious illnesses. Transportation and warehouse – hazardous working conditions persist in this industry. Arts, entertainment and recreation (specifically sports and performing arts) – because of the physical nature, workers are often more likely to be injured. Agriculture, forestry, fishing and hunting – specifically animal production workers are at high risk because of the use of dangerous equipment. Manufacturing – again, high injury risk due to the use of dangerous equipment. When working in high-risk jobs, safety precautions must be strictly adhered to and care must be taken when handling dangerous equipment. It is the responsibility of management to provide a safe working environment for all employees. Serious injuries due to someone else’s negligence don’t always occur in the workplace. Businesses, public areas and private homes are also prone to accidents. And it is up to the injured individual to hold liable the responsible parties. If you or anyone you know has been involved in a workplace accident and suffered a workplace injury, illness or disease, contact us for accurate claim advice. At Friedman, Rodman & Frank, we are experienced in dealing with personal injury compensation claims for people injured due to someone else’s act or failure to act. Below, you will find information about the most common types of accidents we deal with together with details about how to begin your own personal injury compensation claim. If you or a loved one has been harmed in an accident, we recommend that you speak with one of our attorneys. We are available 24 hours a day, 7 days a week and provide free, confidential consultations. If you need to speak with an attorney in Spanish or Creole, the personal injury lawyers at our law offices can speak with you. Contact our experienced Miami personal injury attorneys toll free at 877-448-8585 to schedule a free consultation.